Samsung on Thursday said it had begun to mass-produce its first SoC for miniature IoT devices, the Exynos i T200. Aimed at devices that do not need a lot of compute power, but require ultra-low standby power consumption, the first Exynos i SoC integrates processing, connectivity, security and other capabilities. 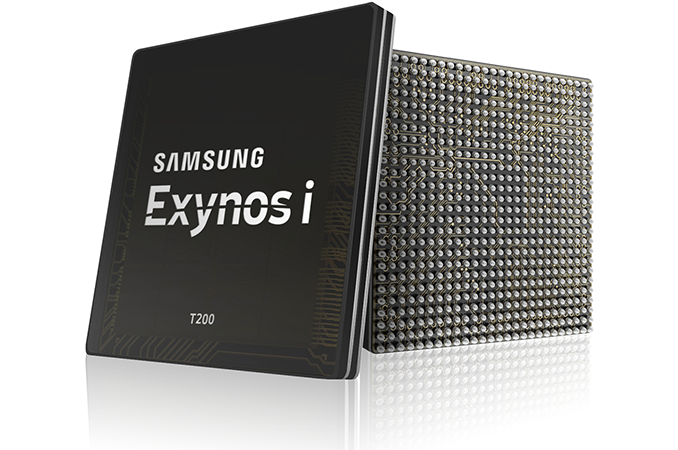 The Samsung Exynos i T200 SoC uses one ARM Cortex-R4 CPU core and one ARM Cortex-M0+ CPU core for real time processing and microcontroller applications, with both cores running at 320MHz. For connectivity, the chip also contains a 802.11 b/g/n single-band (2.4 GHz) Wi-Fi controller and supports IoTivity protocol that enables interoperability between IoT devices over various protocols. 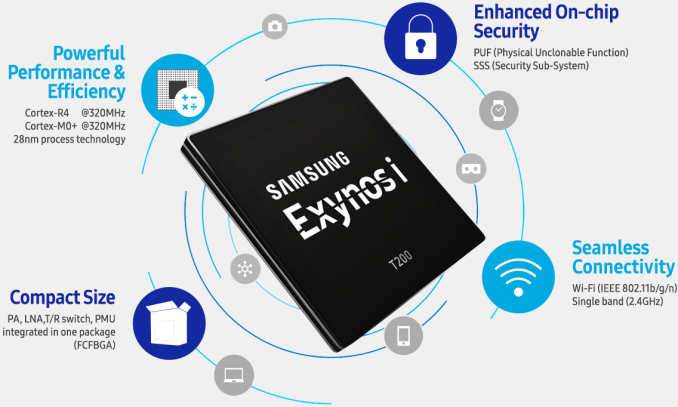 In addition, Samsung’s Exynos i SoC has a security hardware block called the Security Sub-System (SSS) as well as a physical unclonable function (PUF) for secure data storage and device authentication. The Exynos i T200 chip is made using Samsung’s “low power 28 nm HKMG” process technology, but Samsung does not specify which one. As for packaging, the SoC comes in an FCBGA form-factor. Samsung did not indicate if and when it plans to start using the i T200 chip internally. Since Samsung also sells Exynos SoCs to third parties, it is possible that the Exynos i T200 ends up in devices made by other makers. As for pricing, the SoC uses a Cortex-R4 and a Cortex-M0+ cores, which are very small and optimized for low costs, therefore, it is unlikely that the Exynos i T200 will be expensive.